Back in January I took a very quick trip to Korea to visit my friend Susan. I know travelling halfway across the world and spending more than half a day flying doesn’t really justify seeing a single city for 6.5 days, but hey, such is life. This was a rare opportunity for me to go, where I would have accommodations sorted out and also have a personal tour guide who spoke decent Korean. It was unfortunate that I went in the dead of winter, and even although I’ve endured -30 degrees celsius weather, walking outside all day in -8 degrees is definitely worse. The purpose of the trip: to visit Susan, to eat, to shop. Before I dive into the good stuff, I want to point out a few very different things about Korea. I’ve visited a handful of Asian countries, lived in Hong Kong for almost year, and have basically seen and experienced some of the less pleasant things Asia has to offer. From using disgusting smelly co-ed gas station bathrooms where you had to “go” in a hole in the floor, to eating food out of a cart in a dingy dark back alley with stray dogs eyeing your every move, I’ve pretty much become desensitized. I don’t enjoy it, rather it’s no longer shocking. All the places I’ve been to in Asia; Hong Kong, Bangkok, Kuala Lumpur, Guang Zhou, have all been crowded, dirty, bustling, and what I call generally uncivilized cities (not uncivilized in a third world way, but in a lack of mannerism way), Seoul definitely stood out from crowd. Although I was told by my friend that is was unusually quite when I was there, on the most part, people were very well mannered, polite, and well… civilized. There was no pushing to get onto the train, a busy supermarket did not result in grocery cart bumper cars, and the locals were friendly and helpful. Cleanliness was impressive. Not only on the streets, but public bathrooms as well. It was an Asian city like no other. I have never been to Japan before, and I would guess the mannerism and culture would be similar, but for now, this city took me by surprise. – You cannot flush toilet paper down the toilet. Apparently the sewer system isn’t strong enough to carry the toilet paper through the pipes, so to prevent clogging, when you use a public toilet there is a garbage can to dispose of your dirty used toilet paper. Yes, ewwww. – Just as North America has fire extinguishers and first aid boxes in public areas, Seoul has gas mask boxes in their train stations. Due to the uncertainty of their northern neighbours, authorities, as well as children, are trained in the event of any attacks or bombings. The sight of the emergency box left an uneasy and slightly paranoid feeling. 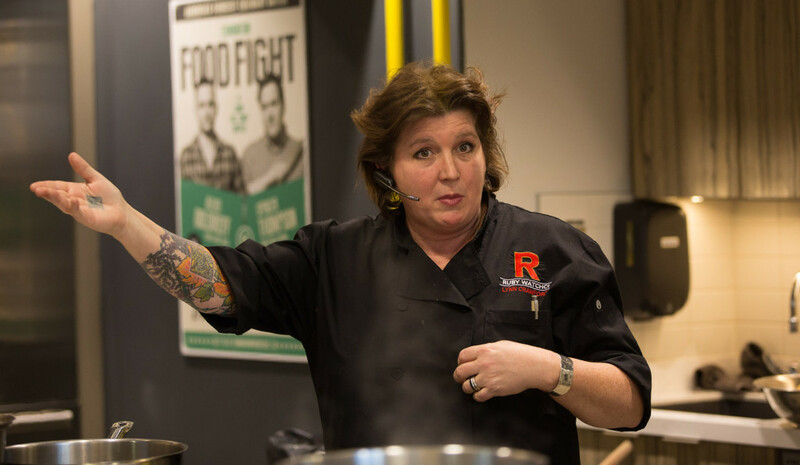 – Almost all food courts have refresher stations in them. There is a sink to wash your hands (prevents unnecessary bathroom lineups), readily available sanitized cups, and clean drinkable water. What an ingenious idea! Ok, enough rambling about the culture, lets get on to the food! I arrive in Seoul at 6pm, the perfect time for dinner. Susan takes me to this cute restaurant on the second floor of some building (I apologize for the amount of vague descriptions I will be giving) and warms my stomach with a delicious pork bone stew. It was so comforting, for a moment my jet lag disappeared. I quickly learn that almost everything you order in this city is meant to be shared, and eating by yourself is slightly depressing. 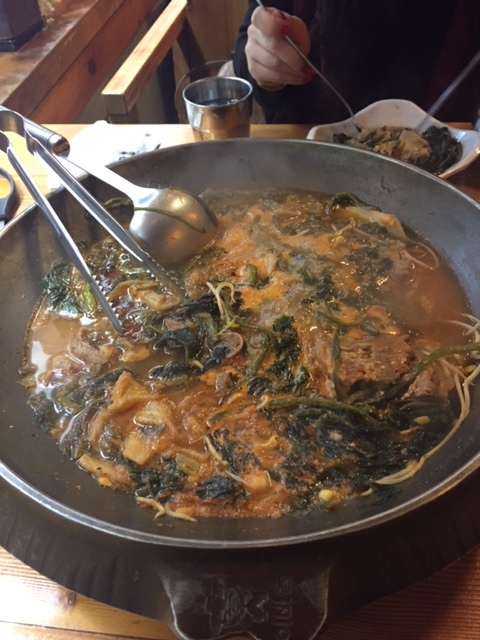 After stirring the gigantic pot around, we uncover potatoes, vegetables that are similar to watercress in taste, bean sprouts, and fall-off-the-bone tender pork. ItNaengmyeon was spicy, as is almost everything I ate in Korea, and I also quickly realized that condiments accompanied all meals. We were off to a fantastic start! Paris Baguette became my breakfast place of choice for the next couple days. One, because it was on route, and two because the coffee cup was so damn cute. A sausage pastry bun did the trick this morning. For lunch, one of my favourite Korean dishes, naengmyeon, cold spicy chewy noodles. 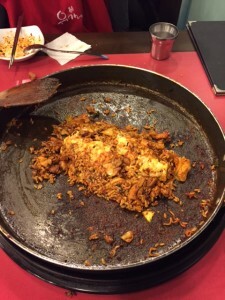 This place which was on the second floor of a building in Myung-Dong, the touristy shopping street, and only offered 2 dishes. Cold spicy noodles without soup, and cold non-spicy noodles with soup. 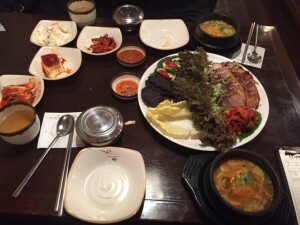 The majority of the restaurants in Seoul followed the same menu pattern. Each food shop specialized in one dish, and that is pretty much all you can order with slight variations such as meat, or in this case soup or no soup. It is very different from Hong Kong where they offer so many dishes your head almost spins backwards trying to decide. 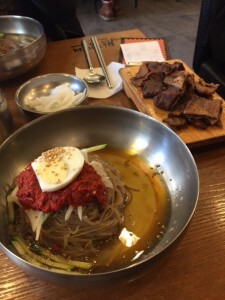 I’m a sucker for naengmyeon, so needless to say, this bowl of cold noodles was amazing. The texture of the noodles was perfect, the spice level was just right, and an accompanying side of BBQ short ribs is always a plus. Soy chicken was for dinner. Do not let the bland name fool you, as this is one of my favourite meals. A, yet again, gigantic bowl arrives at the table overflowing with chicken, potato starch noodles, rice cakes, dumplings, potatoes, carrots, onions, and cabbage. 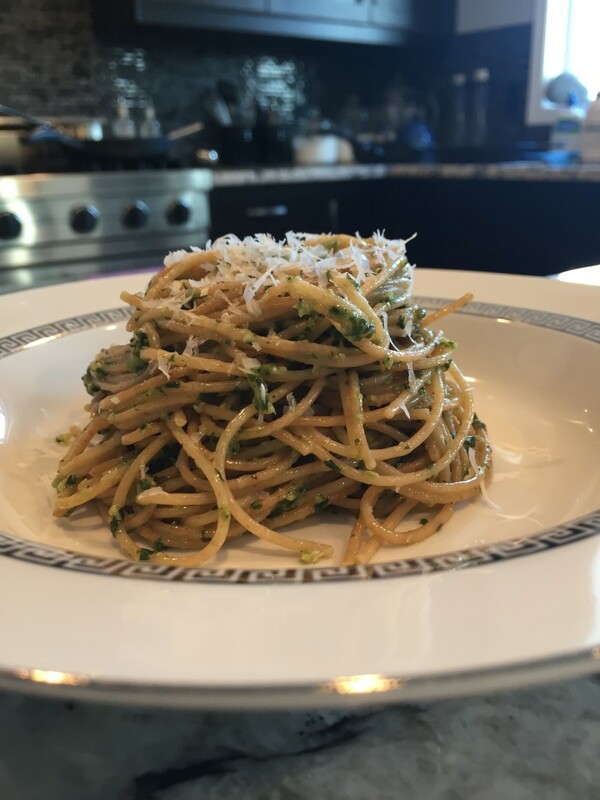 If you ever needed an example for umami, this would be it. The soy was flavourful but yet subtle enough for you to eat bowl and bowl, the chicken was tender, the noodles absorbed all the soy goodness, and the rest was just icing on the cake. I don’t know how else to describe it other than it being a perfectly balanced medley of soul satisfying ingredients. Whoever thought of this dish is a genius. The day starts off at Paris Baguette again because I am left to my own devices for the morning. I muddled my way onto the bus and managed not get lost. I enjoy a strange pastry with a creamed corn topping while waiting for Susan to get off work. The cute coffee cup was also back. Lunch was Chinese food. Not the Chinese food I typically think of, but what Koreans consider to be Chinese food. The joke is that apparently all Chinese eat spicy seafood soup and black bean noodles, which we do not. 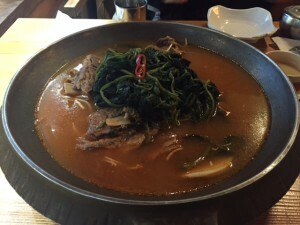 We eat at the Chinese restaurant on the 12th floor of the Lotte department store in Jung-gu. The food was average, but the view out the window overlooking the busy street below was worth the stop. Bossam was for dinner. This is also another top contender, and how can it not be? Succulent pork belly that can be wrapped using a variety of fresh crisp lettuce leaves, filled with your choice of pickled condiment, accompanied by white rice, and warm spicy tofu soup. 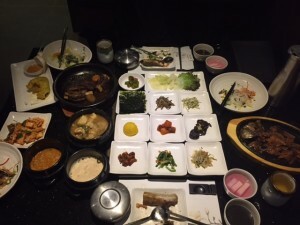 Korean’s love to assemble their food. You pick exactly what you want in each bite and how small or large you want your wrap to be. The pork belly was tender with just the right proportions of fat, and the dips and pickled radishes add an opposing but balanced flavour and texture. Everything paired well together, no matter what combination of lettuce and picked radish or lotus root you used. It was a fool proof DIY meal. We stopped at a chain/franchise quick service cafe for lunch. 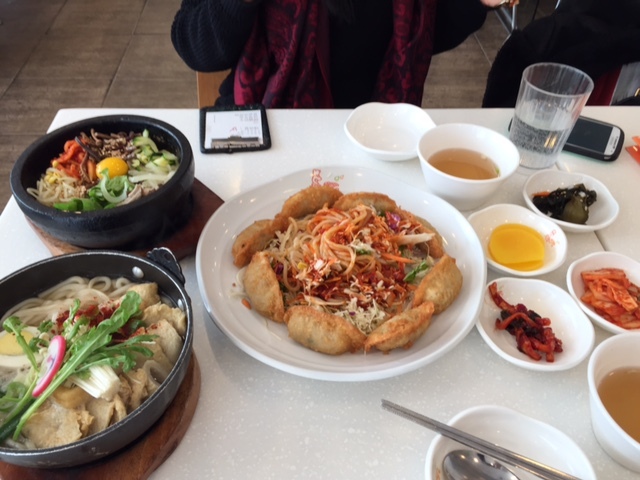 I had a craving for bibimbap, and Susan had a craving for mandoo. Mandoo are dumplings, but these particular dumplings were deep-fried. The pork filling inside the mandoo was excellent, and the crispy shell even managed to trap in the tasty liquid when the pork was cooked. 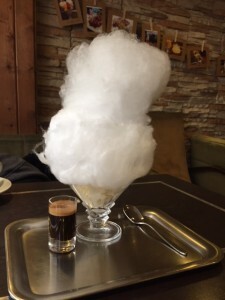 It made a bit of dangerous mess on the first bite as steaming hot liquid gushed out, but was certainly worth it. The bibimbap was good but nothing memorable. The other contender for my 3 favorite meals was today’s dinner. 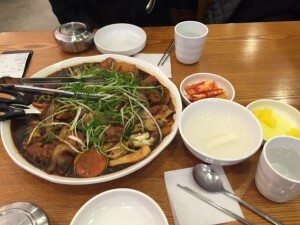 Ddeokbokki. How can I describe this meal other than it being a bubbly bowl of fried, cheesy, gooey, spicy, rich piece of heaven. The restaurant was called Uncles, and its mascot was a squid, so naturally we ordered the calamari ddeokbokki. 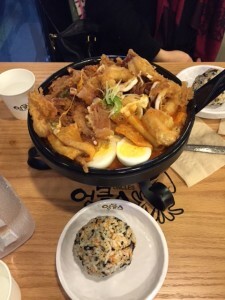 Out came a caste iron pot with rice cakes, hard boiled eggs, cheese, and of course calamari. We also ordered a side of jumokbap, which is rice topped with seaweed, fried stuff, sesame seeds and tobiko. 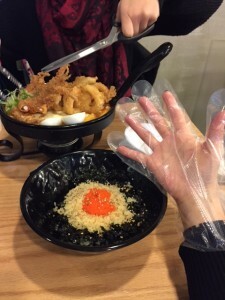 While Susan cut the squid tentacles into more manageable pieces with the scissors provided, I mixed the toppings into the rice with a glove provided and formed it into a more appealing shape. This meal was amazing, and not to mention filling. Between the mixed rice, cheese, batter, and rice cakes, it was pretty much carb overload. 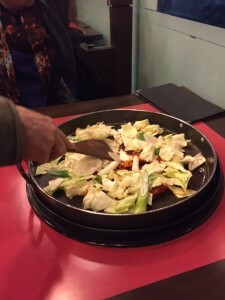 We chose the medium level of spiciness, hoping that it could more comfortable to eat but found that we still took frequent breaks to prevent our mouths burning up. Even with the slightly painful spice level, this meal was fabulous. I would return to Seoul for this alone. I was a guest at Susan’s junior high school girls class and after a very personal Q&A session on getting to know “the foreigner”, the school ordered fried chicken for lunch. I have a weak spot for Korean fried chicken, and this simple delivery box of light and crispy chicken pieces made my heart smile. The batter was airy light and golden crispy, almost tempura like in density, but it coated like a batter. Throw a couple of dips in, plus pickled radishes, and I was a happy camper. Dinner with Susan’s friends, eating the oh so infamous Korean BBQ. There’s nothing more to say except mm mm mmm. After touring the Gyeongbukgung Royal Palace on my own that morning, I stop in Myung-Dong and munched on an egg bun from a street cart while waiting for Susan to get off work. The bun was sweet and mid-deep was a hard cooked egg. It was much more filling than it looked. I was still full off the strange egg bun when lunch came around so while Susan dined, I indulged in a cotton candy affogato. 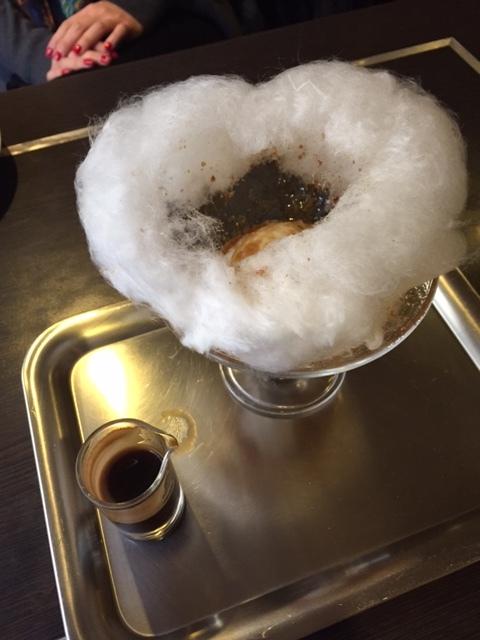 This beautiful tower of cotton candy soon turned in a slurry of sugar and coffee as I poured the espresso on top. The warm liquid amusingly melted the candy away, creating a soupy mess with the ice cream at the bottom. It was most delicious. Ah dinner. What i love most about Asia is that you don’t need to spend a whole lot to get a great meal. Not only was this meal cheap ($20 CAD for 2 people), but it was filling and included table side service. Did I also mention that it is NOT customary to tip in Asia!? We sit at a table with a built in gas stove top. The server/owner slaps down a gigantic pan, throws in raw cabbage, Japanese leeks, chicken and red pepper paste and starts to sauté. As the vegetables cook down, he brings out a monstrous looking ring, and places it around the pan to protect us from the splatter. Next comes the ramen. What a delicious and interactive way to enjoy stir fried noodles! Susan and I save half the vegetables and chicken because we decide to turn the remaining goodies into fried cheese rice. I know, I know, at first I thought cheese in fried rice was very strange, but believe me, it is absolutely fantastic. The owner comes by again and puts on another mini show by turning the pan and scrapping down the cooked bits. After a flip here and a flip there, out churns this cheesy well formed rectangle of fried rice. It was phenomenal! You haven’t had fried rice until you try this! It was spicy, it was cheesy, it was savoury. My mouth is salivating just thinking about it. We take a long train ride to warm our stomachs with spicy tofu stew. We end up in a food court, but not just any food court, one where you can sit on the floor and enjoy your meal in comfort, somewhat like an open concept tatami room. The stew comes out in a steaming hot stone bowl and you crack in a quail egg. You can either mix it all up and scramble the egg, or let it cook and eat the yolk whole. Condiments of course follow, along with a bowl of rice with bean sprouts and seaweed. The tofu was soft and silky, and although I’m not a fan of tofu (as mentioned in my short bio), I must admit that it was pretty darn delicious. My last dinner in Seoul. After spending the afternoon relaxing at a spa that boasts 7 different saunas, our grande finale meal was conveniently next door. This was the granddaddy of all meals. Based on traditional Korean home cooking, this restaurant offers classic dishes in a lavish setting. We choose the gable jjim and barly gulbi full set. This offers 18 different dishes: seasonal porridge, clear kimchi, well-being assorted salad, five-colorer tangpyeongche, imperial japchae, fresh kimchi, braised pork wrap with medicinal herbs, assortment of pancakes, black sesame tofu, assorted fried platter, galbijjim (traditional braised short ribs), barley gulbi (cured barley gulbi), dwenjang stew, soybean curd stew, kang dwenjang, fresh vegetables for wraps, 10 seasonal side dishes, steamed rice. If you wanted to be real technical, the total count on the dishes was actually 27 if you want to include the little side dishes. The spread was absolutely gorgeous (although I feel bad for their dishwasher)! I wasn’t sure what half the stuff I ate was, but it was sure pretty to look at. Needless to say, it way too much food for the 2 of us. I can eat, but this meal, which they deemed for 2, could easily feed 4. 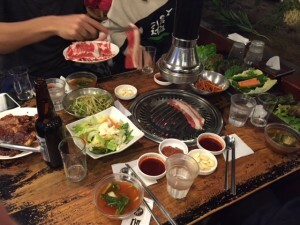 It was the perfect feast to end my last day in Korea. We have enough time before my flight to grab a quick lunch. What I love most about Seoul is that restaurant owners take such pride in their establishments. Unlike Hong Kong where shops can be dirty, uncomfortable and packed like sardines, the restaurants here are clean, cozy, and you never have to share tables. You don’t get an impatient stranger hovering over you, waiting to steal your table the moment you finish your last bite. You can eat, chat, and sit for basically as long as you want without being harassed. I finish off the trip with some light, and what I thought was simple, congee. Only the Koreans can manage to turn congee cute. Out came a bowl of minced beef and mushroom congee. The mushrooms were arranged delicately in a circle on top, and it came with, of course, pickled condiments. The side dish of braised beef was especially good. It was the ideal relaxing meal to end an eye opening vacation. Would I return to Seoul? Yes, yes I would. To be honest, before going, I did not have high expectations for Seoul. I assumed it would be just another typical Asian city; crowded, dirty, rude, and filled with hustle and bustle. It was everything but. It was amazing to see a modernized city with skycrappers in the downtown core, who at the same time is able to preserve the traditions and culture of a 14th century royal palace a block away. What would I go back for? The food of course, and the shopping was good too. I’m not talking about just the clothes and cosmetics, but shopping in Emart, Seoul’s largest grocery store, was definitely fun. My trip may have been short, but it was worth it. Thank you Seoul for expanding my horizons, and thank you Susan for being an amazing host. I hope you too will enjoy Seoul as much as I did. Here’s to my first food related but not directly food related post. Pinterest has gotten me again, and this time for home DIY projects. When my husband and I did a full overhaul on our kitchen years ago, we had the luxury of planning everything. How much and what type of storage, gas range, cabinets, backsplash, the whole works. We also picked this gorgeous stainless steel Jenn-Air French door fridge which I absolutely love, except it had one tiny downside. The doors would not hold a magnet. I’m a planner. From vacations, to work, to grocery lists, I like to see things written down. I frowned upon the thought of sticky notes overtaking my beautifully polished fridge, and without magnetic capabilities, the outside of my fridge sits naked. I do however, have a somewhat bare wall just off to the side of my kitchen which will made for a cute little chalkboard. 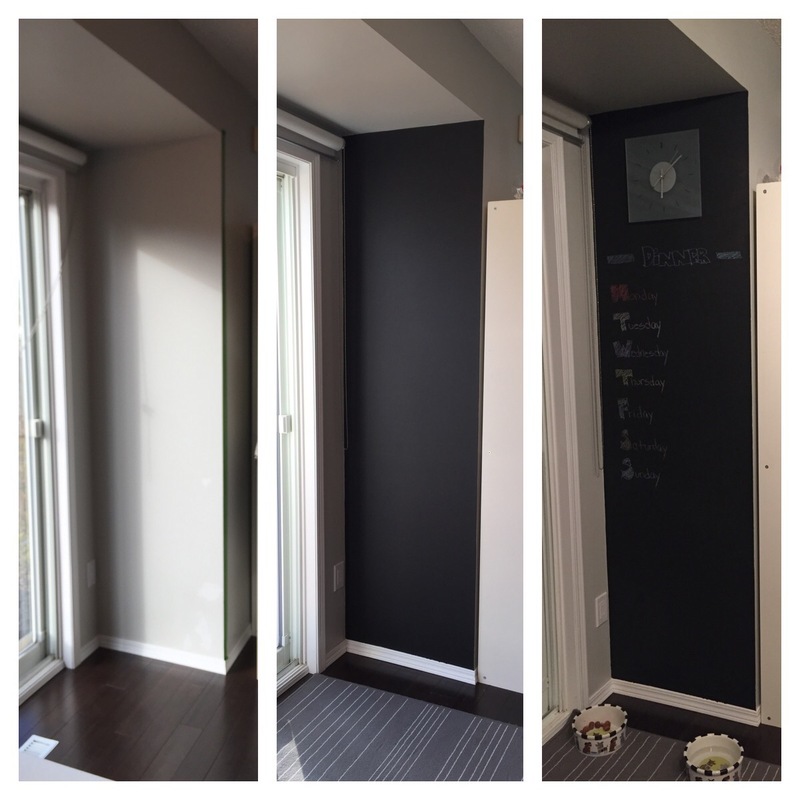 Chalkboard paint can be purchased at any home hardware or paint store. The little can will cost you about $22 and it is extremely easy to apply. Just paint. No priming (unless you’re painting metal or wood). Wipe your calls clean, let it dry, and slap it on. On the first coat you will notice the paint is a bit unforgiving. If your walls are light-colored, which mine are, the old paint will definitely peek through the black. Roller lines are slightly visible and at first glance it does not look sleek at all. Wait 4 hours, and by the time you put the second coat on, all imperfections will be masked. After your final coat you will have to wait an agonizing 3 full days before you can prime the chalkboard. To prime, simply take a long side of a pice of chalk, the bigger the better, and coat the entire surface. Wipe with a dry cloth or paper towel and you are ready to doodle! Don’t like that film of chalk residue? Neither do I. So after another 7 days, you can take a wet cloth and wipe the wall down. Then it will look beautifully black and polished, as a chalkboard should. The instructions say that after you wipe clean you should prime it again but don’t bother. After the initial prime, any remaining chalk writing will come off with no issues. 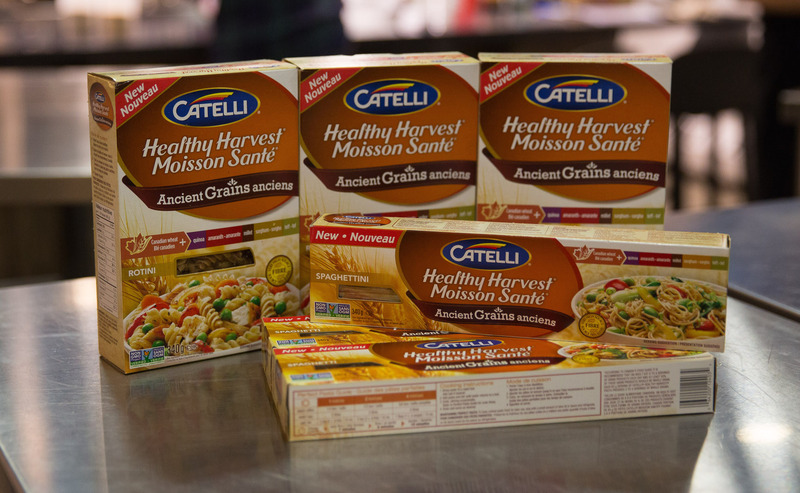 I use it for meal planning, which has prevented a lot of last minute fast-food meals, and for jotting down what I’m craving so I can bake it on the weekend. Whatever you use your chalkboard for, it’s not only practical but adds a personal touch to your home space! Finally, a Pintrest idea that works! I love Pintrest, as a lot of people do, and I have so many DIY and food pins that it’s time to make sub-boards. After seeing many pins about baked avocado and egg, I finally had a chance to try it over the long weekend. As my patience ran short that morning, I did not wait for Pintrest to load up the recipe. This was the perfect time to just wing-it! – make sure you haul out enough avocado to fit the size of egg you’re cracking in, or else you will have a pool of egg whites on your counter. – cup your hands while wrapping the bacon around the avocado. Between the slippery avocado and egg white dripping off the sides, your breakfast may end up on the floor. – serve in soup bowls or another dish with sides. If you like your egg yolks soft, there will quite the mess. 2) Half avocados and remove pit. 3) Hollow out portions of the avocado center, just enough to fit the cracked egg. Be careful not to break the walls of the avocado. Using a large spoon, remove entire avocado and skin. 4) Carefully crack egg and drop into the well of the avocado. 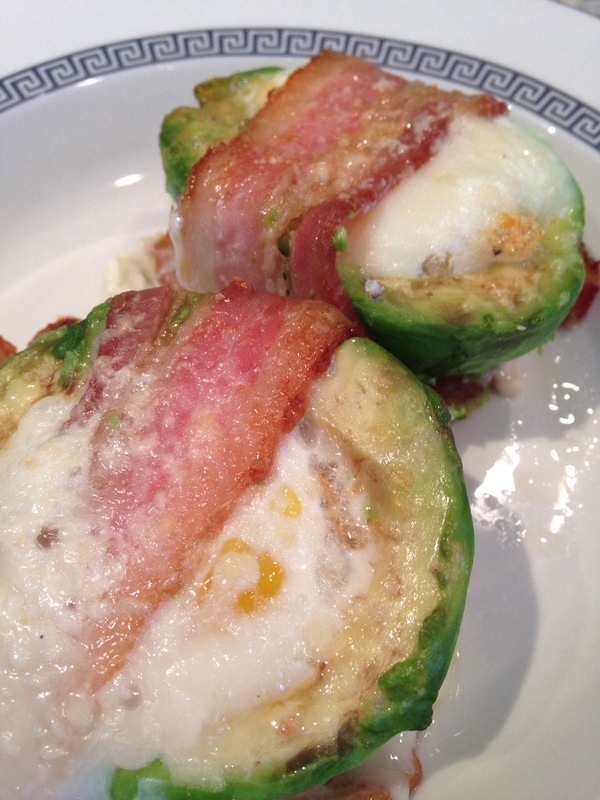 5) Drape bacon horizontally across avocado and egg, carefully wrap around and place in baking dish. Repeat with remaining avocados. 6) Grate cheese over top. Season with black pepper if desired. 7) Bake for 20 minutes for a soft yolk, or 25 minutes for medium. 8) Carefully remove with spoon and serve warm. Those who followed my 365 days of food last year know that in May I essentially made a lifestyle change to try to eat healthier. 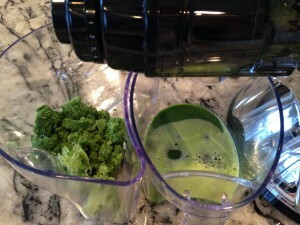 I incorporated the Glowing Green Smoothie from Kimberly Snyder’s book The Beauty Detox Foods. It’s been 9 months, and I’m proud to say that I still drink this smoothie 4-5 days a week. Now don’t get me wrong, I did not convert to a vegan, vegetarian, nor anti junk food eater. I merely tried and am still trying to eat healthier, and by try I mean some days I do and other days not so much. If you wave bacon in front to me, chances are I’ll wolf it down with little remorse. I still believe that everything should be consumed in moderation, the good and the bad. Let me give you the prologue to how this juicer came about. It all started with my sister-in-law. After watching the movie Fat, Sick, and Nearly Dead, she decided to put her family through a 10 day detox, only consuming juice. While over at her house one day, I saw a pretty, shiny, chrome juicer sitting on her counter and the rest was history. I opted for the same brand and juicing style as hers, Omega, which masticates instead of centrifuges. From the research that was done, it seems that the masticating machines, which uses an auger to squeeze and force the separation from fruit/vegetable and juice was far superior. Not only does it use less heat and friction to extract, therefore preserving more enzymes, it also produces a higher juice yield. This fancy juicer did not come cheap, as I forked over $397. Good thing shipping was free! 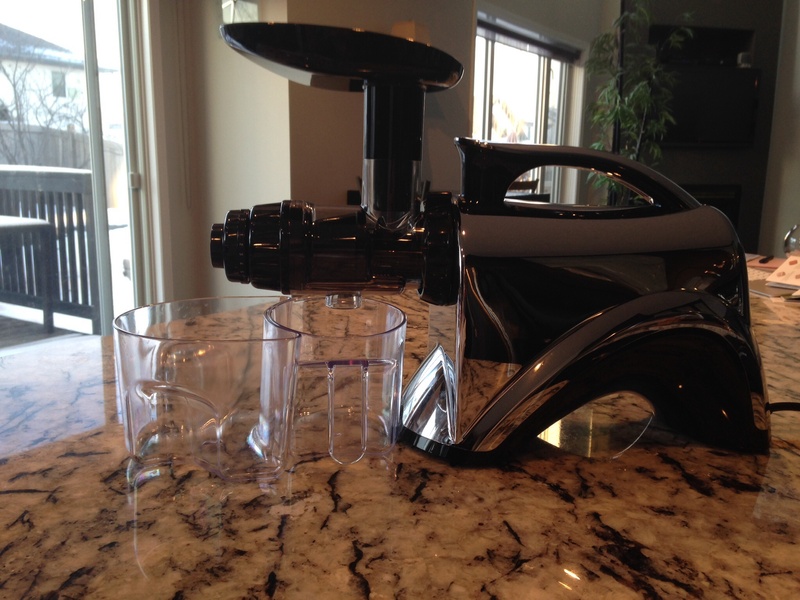 As I waited for my juicer to arrive, I went on a sales pitch trying to convince my friends to buy one too. One of the debates was whether juicing was better for you compared to blending. My friend who already had a Nutribullet (who I usually am successful at convincing her to buy pretty much anything I buy) was happy with hers. She felt that the Vitamix did such a good job at blending her morning drinks, and there was no need for a juicer. Another concern that came up was the loss of fibre. While juicing extracts all the nutrients and vitamins, the fibres, which our bodies still need, are separated and discarded. While I agree this is a valid reason, for someone like me who does not like to eat fruits or vegetables, a juicer is the only way I will get all that nutritional goodness. There is no way I would normally go through a Costco sized bag of oranges in less than a week! It’s only been one week since the juicer has arrived, and only a handful of recipes have been tried, but I’m still very happy with the Omega. Although some of the pulp finds its way though the sieve (for oranges and ripe pears), the majority of the juice that comes out is just juice, and the pulp that is separated feels dry to the touch. The parts come off with ease and can be quickly cleaned. 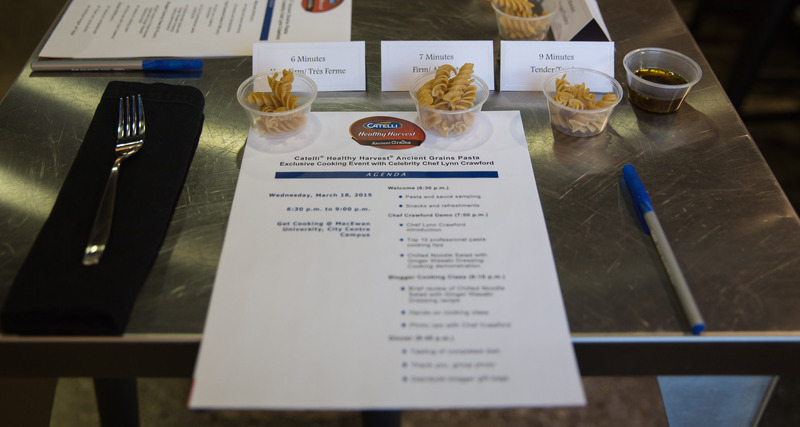 The machine also came with other attachments to make nut butters, baby food, and various shapes of noodles, which will be explored another time. I’m dying to try a berry recipe but they’re not in season right now, as well as a recipe with pomegranate seeds. All in all, I’m very happy with this purchase. 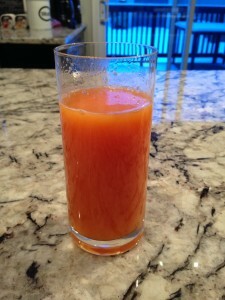 It’s so easy to juice that even a glass of fresh orange and carrot juice right in the morning before work is doable. It literally takes less than 5 minutes to cut and feed orange segments through the machine, and it will give you such a lift to start your day. You will also never throw away old vegetables and fruits again. 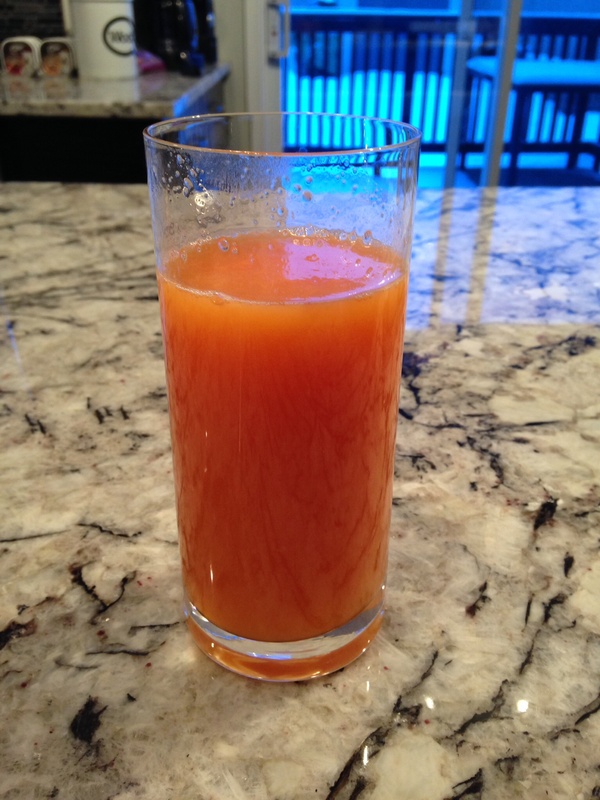 If they’re on the verge of going bad, juice it! This is just the beginning, more juicing recipes and other interesting things you can do with the Omega NC900 to come.